Smile with pride. Act with heart. Live with soul. Those are words that just mean so much to all of us here at MJC each and every day. But I would have to say, there is a little more love fluttering through the air during the month of February. This month is always a great time for a fresh start, as we get to share our newest collection of pretties, and of course, the start of spring (whether the weather agrees, haha). We were so excited to bring you so much to love in our newest collection, and we hope these Valentine’s Day inspired looks are stealing your heart. Now, don’t forget to snap a pic and share with us with #matildajane as you all are truly a whole lot of lovely with those special moments captured! Here in Indiana, we still have mounds of snow, but we are definitely dreaming of warm sunny days outside … But until then, we think a little indoor activity is always a fun way to keep the kiddos’ creative juices flowing – whether it is after school, on the weekend, or at your MJC trunk show. 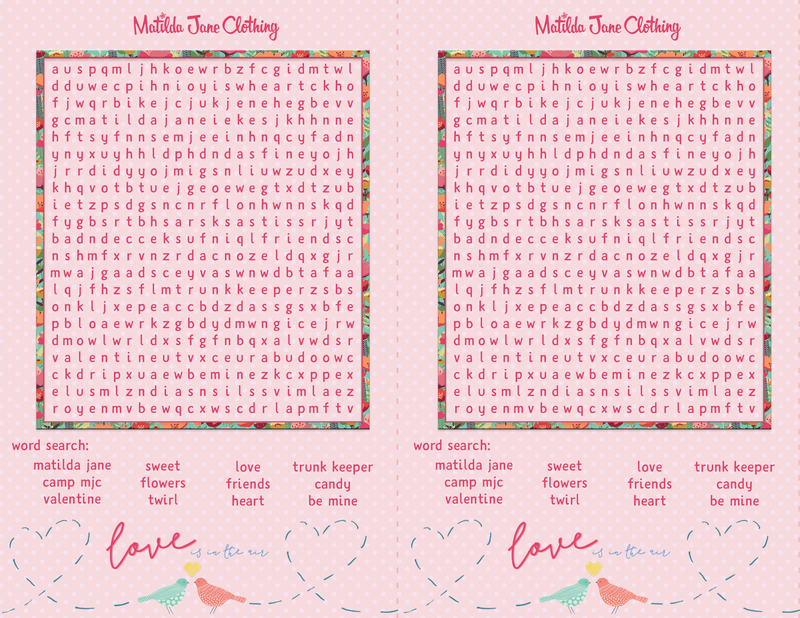 With Valentine’s right around the corner, we thought another MJC Pretty Printable was in order, and today we have a Matilda Jane word search created just for you! Be sure to click on the picture below to download your MJC pretty printable today. 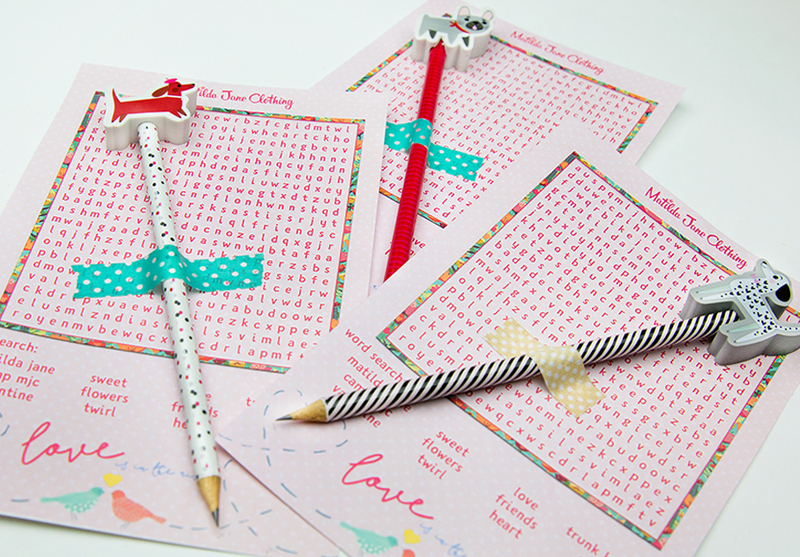 Each sheet has two crossword puzzles, one for your cutie … and one for her bestie. And if you are in need of some extra Valentine’s, print these on a little heavier paper such as cardstock, tape an adorable holiday pencil with washi tape, and voila! An instant MJC Valentine. Thank you! !😍 You’re the best!! Hi everyone! We are so happy to finally be able to give you a little peek at our newest collection: Camp MJC. If we had two things to say about this launch it would be: 1) FUN! and 2) NEW! Like all of our collections, Camp MJC really started in the hearts of our product team. Making new friends, having new adventures, and all the sharing and growing – these great things about camp are perfect for the Matilda Jane girl! Once we started talking about it, we just couldn’t let camp go. Everyone on the team had these wonderful girlhood memories of camp, and all of those sweet memories inspired a whole season. We wanted to give her just what she needed to have her own magical adventure every day: lots of comfy knits, a really good rain jacket (two actually), puddle-worthy boots, even a pair of soft-as-can-be overalls. For me, the inspiration for Camp MJC was fresh. Since moving from the East Coast to Northern Indiana, I’ve spent a lot of the spring and summer at nearby lakes with my own girls. There’s a spirit of nostalgia and new traditions I wanted to capture. You see it in the color palette. We used a lot of florals and brights, but I would describe them as vintage brights, almost as if they were slightly sunkissed, giving the whole collection a magical feel. And as a special surprise, we knew that a February launch absolutely needed a Valentine’s Day touch – done the MJ way of course. The original prints – sweet strawberries, favorite dots and stripes, and our cameo heart – are festive for sure … but they are also something she can wear all season long, and of course at camp! That’s really our hope with the whole collection. We wanted to capture the spirit of camp no matter what your age – making new friends, trying new things, stepping into a brand-new adventure each day. We hope this collection makes her feel like she can take on anything. We want her to feel confident and adventurous and happy, like a true Matilda Jane girl! Can’t wait for you to see it all! The new collection arrives tomorrow!! I absolutely love love the colors! I’ll be ordering soo much from release!! So much cuteness! Is it available by 12am? I love this line of clothes!! I am so excited to see this collection, Madeline. I love how you said “sunkissed” colors; I can’t imagine a better word to describe my favorite palette of colors. Brilliant. Cheers to a beautiful collection! How can you not love this collection?? !